Are your tax records providing access to your identity? This article was written by Joe Sutton, Head of DeleteMe at Abine. Each spring, we are reminded of one of the unfortunate constants in life: paying taxes. As Tax Day approaches, the relief that comes with filing taxes and the anticipation of receiving a refund is enough for most people to happily forget about their taxes until the next year. Unfortunately, they may come back to find you in ways you might not expect. The question is a simple one: Are my tax records and information public record? The short answer is no. Federal and state tax records do not fall into the same category as voter records or marriage records. The good news is that there are very few instances where this information can be accessed (tax related court cases, financial aid requests, etc. ), and the Internal Revenue Service prohibits disclosure of your tax returns except in these rare cases. That means your neighbor, the mailman or your friends will have no access to this sensitive data. More information on this topic can be found here. That means before you know it, you could start seeing your name, date of birth and home address posted on people search and data broker websites all over the Internet. With a simple Google search, your private data could be accessed by anyone, anywhere, free of charge. What happens if your information is already out there? DeleteMe can help. Our service helps to keep your data private by searching for and removing your personal information from leading data broker and people search websites. 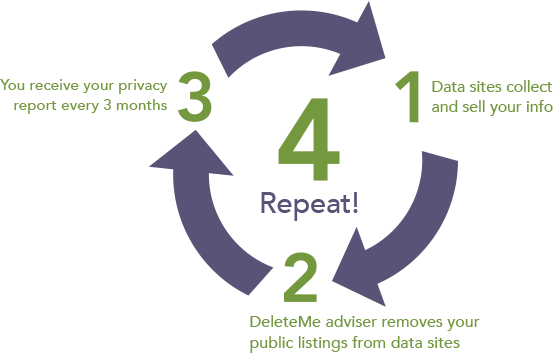 DeleteMe monitors and removes your private information for you throughout the year, making sure that if your information appears listed on search results from a data broker site that ranks high on Google, we can have it removed. Try DeleteMe today. Why are my Masked Emails not forwarding properly? Your questions answered.